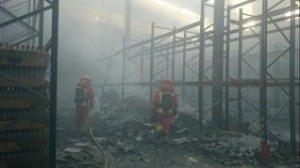 A fire has completely destroyed an oil factory in Algemesí, according to the Emergency and Fire Consortium of Valencia. It started around 6.00 am on the premises of Acevesa, an oil factory located on Carnisers St. of Algemesí, in the region of La Ribera Alta. The cause of the fire remains unknow. The factory have been completely burned, and the extinction of the incident involved 6 vehicles coming from the parks in Alzira and Cullera. It is important to re-emphasize the importance of passive protection and smoke evacuation in this type of naves, which are not required to meet any fire regulations because of its age. They are a real problem for the adjacent buildings, including injuries and possible fatalities.